Bankruptcy asset sales of fabric raw materials. Make your bid! Do you want to buy fabric raw materials for the textile industry, but don't want to spend a fortune? Join our online auctions! Industrial Discount is the reference portal for those who choose to invest in the used market, thanks to the combination of the cheapness of auctions and the benefits of online sales. Our system reduces distances and communication times, ensures you extraordinary savings and offers the best transparency of procedures. That is why it is the most convenient and safe way to increase your business! Each item is provided with a full description and includes photos and technical specifications. If you need any further information, contact the auction agent: you can request an appointment to expose your questions or arrange a visit on-site to inspect the items before making your offer. Follow the online auctions of your interest! Through the Watchlist feature in your account, you can track the bidding activity on your favorite items, check the expiration time and see with no time delay if you won an auction. Don't miss this opportunity: try to get now the best fabric raw materials from bankruptcy procedures! 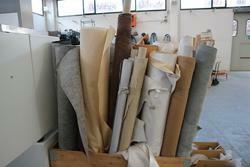 Do you want to stay updated about the upcoming auctions of fabric raw materials? Subscribe to our newsletter! You will receive a weekly email showing new items for sale.